Pineapple is the most people friendly horse around! This horse loves to be with people, get petted or brushed or just hanging out. He is drop dead beautiful. 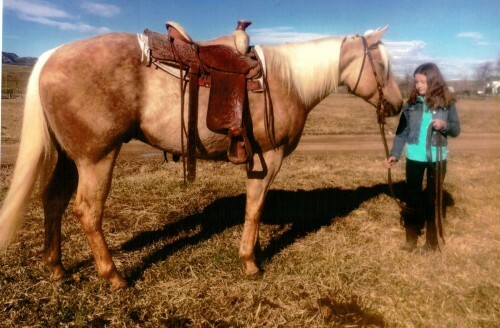 A golden palomino with huge dapples, a flowing white mane, tail and foretop and standing 15 hands, 1150#s. He’s been on our ranch for over a year, gathered cattle, roped off of, worked at brandings and dozens of different ranch guests have ridden him. No horse is quieter to ride than Pineapple. No spook or buck. Whatever month you choose to ride him, and no matter how long he has been laid off, he is the same horse. Very very smooth to ride. Great canter and he can really turn around. Great for ANYONE to ride; big, small, medium, young or old, male or female. UTD on shoeing, floating, worming, coggins and health.